Sky Within - This is probably as close as you can get to sitting next to an alive, wise star master who teaches, enlightens, and tells you your own personal story as if it were coming out from inside you. 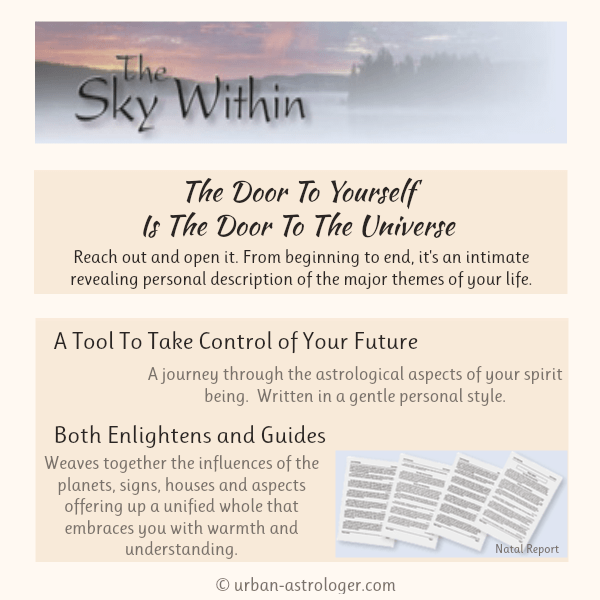 Click here to fill out birth data and order your Sky Within Report now. It’s more than just a quick horoscope reading – it’s an introduction to the spiritual basis of astrology and what it’s about to experience being human. It’s not the kind of natal chart report you casually page through like a magazine, picking up a bit here, and passing over another there. From beginning to end, it’s an intimate, revealing personal description of the major themes of your life. You will read every page until you get to the end, think about what you have learned, and then go back again later to watch it expand itself further after the first read has sunk in. Like any natal report, it covers all the bases: planets, signs, houses, and aspects. But instead of listing individual elements that stand apart, this master storyteller sits down with you and weaves them all together into a unified blanket that embraces you with warmth and understanding. It is like a conversation with a very close and trusted teacher and friend. Filled with insight, it’s presented in a way that allows you to acknowledge truths about yourself and life that ring so true you feel you knew them already, yet you’re hearing them for the first time spoken in just this way. It shows in its own intimate, satisfying way, that the door to yourself is the door to the universe. Reach out and open it.